Hey look, Mike is mailing it in once again! I was flipping through my pictures on Picasa and came across this one... It put me on the floor laughing! 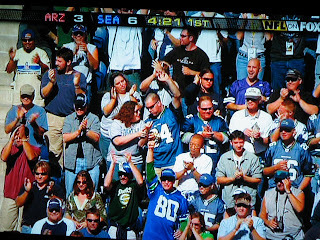 That's me in the #94 jersey behind 'Steve Largent' (#80, for those fresh on the band wagon). the picture was taken of the FOX broadcast recorded on my DVR. I had no idea that it was there until we re-watched the game the next day. My fifteen minutes (seconds) of fame comes around and what am I doing? Chowing down on a hamburger while Carrie points to where her watch hurt her for "clapping too hard". Who hurts them self clapping you ask? My wife. Do you see the concern on my face? I am proud not to have 'whored' myself out to get on camera. No goofy sign, no face pain, no wig. Just me, my wife, her watch and a hamburger. What a difference in outerwear from the last pictures of me from a Seahawks game that I posted here. I'm wearing shorts in one (I can tell because of the khaki) and heavy weight long underwear under the Northface shell and snowboard pants in the other. Still happy though!